How to integrate the dual task? In Germany the situation is different from other countries, such as Russia or the United States. There, school support is very strong. There is no independent sports club system, but it is integrated into the school system. Therefore, the problem of coordination of school and competitive sports is virtually eliminated. Our sister Louisa spent her exchange year at Wyzata High School (Minnesota) and she loved to be part of her school sports team (athletics and down hill skiing). She had almost no problem of integrating the demands. In Lower Saxony there is no cooperation between school and climbing sport system. They seem to be two different worlds. By far we do not have the structures and processes of cooperation, particularly in climbing, as in other German-speaking, i.e. alpine countries, such as Austria or Switzerland. That’s the reason why we went there for exchange during our 10th school year. David was at the Sport-BORG Innsbruck, Ruben at the Sportgymnasium Rämibühl Zurich. Our sports achievements were clearly better at these schools than they are in Germany. Anyway, we try to find some solutions to improve the situation here in Lower Saxony together with our family and our climbing association. That’s not easy. There are many discussions and agreements to make. Furthermore we want to report a little about this (latest news first). Recently I made this public presentation (in German) about the climbing activities at my School – CJD Elze (near Hannover, North of Germany). Included you can find a couple of pictures from Kalymnos (Fotographer: Reiner Eder © VISUAL IMPACT GmbH) where I stayed together with the swiss climbing team from Zurich on Easter. The Kalymnos pics can be started as a slide show by clicking the play button (searching for it with the cursor on the bottom of the first slide; it might take some time to load the slide show!). Since my return from the Rämibühl Zürich in Switzerland and the World Youth Championships in Canada in August I attend a new school near Hanover, the CJD Elze, which has set itself the goal to meet the specific educational needs of young athletes. Together with my climbing base Hanover, that recently won the “Grüne Band” (Green Ribbon) of the German Olympic Sports Federation for outstanding work in youth development, a cooperation agreement was signed at the beginning of this school year, which includes also other agreements in addition to the educational aspects. 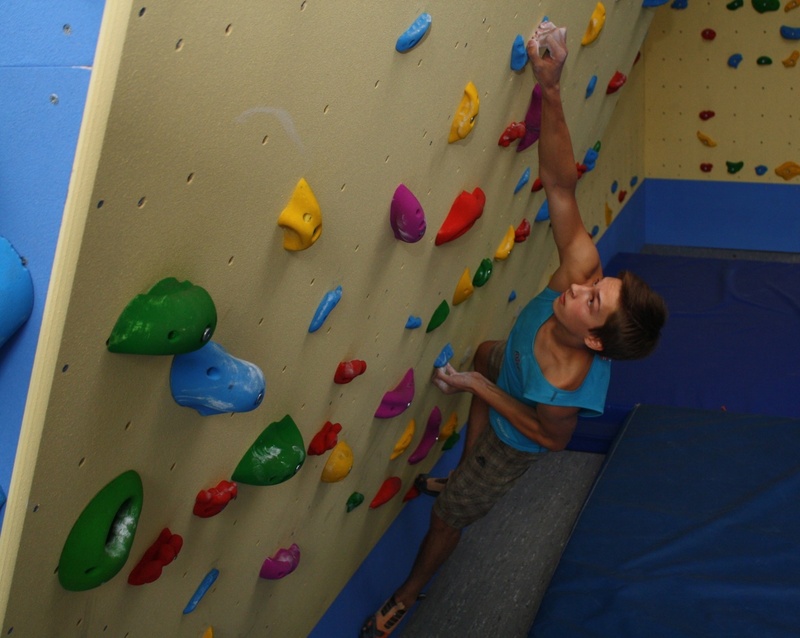 These are screenings of talents for climbing, which are to be done at the CJD, support for the training of sport teachers and instructors at the newly installed climbing wall, which could be funded through the parents’ support association, as well as the implementation of training groups or training hours at this climbing wall and generally in climbing. The school, in return, is supposed to indemnify the athletes for the required training and competition times, to provide the necessary training opportunities and to offer as much assistance as possible for missed lessons or in the planning of replacement services. Moreover, the students can stay in a boarding house. 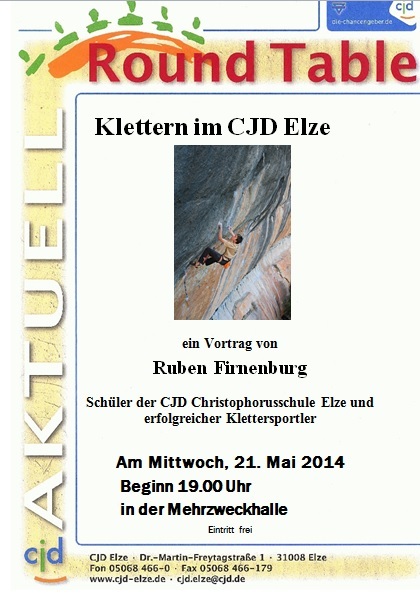 I am the first climbing athlete having moved to the CJD Elze. I am in the 11th school class now and I want to do there my high school diploma (“Abitur”) in 2015. It is important to me that I can arrange that many good training sessions with school. In addition the newly installed climbing wall in the school gym gives me also the opportunity to some training sessions in Elze beside my training in Hanover. According to the already existing cooperation with Eintracht Hildesheim (handball), Hannover 96 (soccer) and the State Canoe Association the CJD Elze offers now with this new cooperation in climbing another way for young athletes to combine their sport and academic ambitions. 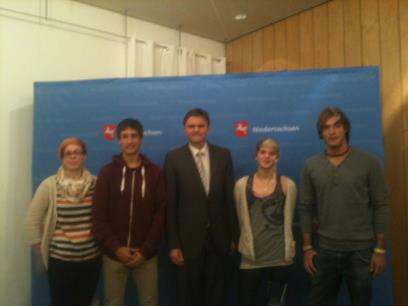 On 09/24/2012 Lena Herrmann and I were invited by Mr Schünemann, the Minister of Internal Affairs and Sports in Lower Saxony. We were among 75 other students and trainees at a “round table” in the Ministry at Hannover. On this occasion problems of compatibility of education with competitive sports were to be discussed and we were supposed to look for solutions. The whole group was divided into students and trainees. In each plenary problems and suggestions were collected. Lena and I focused on scholar issues and addressed some problems such as the lack of additional morning training, attunement of load peaks (competitions, exams, training courses, school trips), catching up missed school classes and other things more. We advocated for the respect of individual needs of athletes and made suggestions for a better cooperation between our climbing association and the ministries. By the way we could see that, in almost all cases, the promotion of fringe sports like climbing is significantly worse in relation to the “Olympians” in Lower Saxony. There is no doubt about a disparity, despite the fact that we have to train as hard and lengthy as in Olympic sports too. Mr Schünemann, in support of Mrs Wallenhorst, who works in the sports department of the ministry, recorded all the athletes’ wishes and suggestions and promised to stand up for their problems. Last of all, Lena and I handed over a letter (Letter to Minister Schünemann, in German) to Mr Schünemann, which provides an overview of the problems and solutions from the perspective of the North German climbing athletes. On 11/29/2012 we had a second “round table” on the “dual career in competitive sports”. Now Minister Schünemann invited representatives from sports, politics and business for further discussion. This time, the areas of school and university education, professional training and job life were treated in common round. To this meeting only four final athletes were invited, among these Lena and me as athletes’ representatives. We both had the privilege to open the session with a description of the problems viewed from the athletes’ perspective. Our focus was again on the school situation. We spoke about the insufficient coordination of school and competitive sports in terms of missing double sessions trainings, no coordination of peak loads, lack of catching-up lessons and, on system-level, no enforcement and power of school sport coordinators. Our views of the problems were picked up, supported and expanded by the representatives of the sports federations. Together with the business representatives they proposed increased funding for individual cases of particularly talented athletes in the fringe or non-funded sports, as well as we already mentioned it in our letter to Minister Schünemann. Finally, one can say that there is still a lot to do on dual careers in competitive sports in Lower Saxony. All participants made a real effort on this. Lena, I and our climbing association will also strive to continue exchange and cooperation on the issue.